At Distinction Te Anau Hotel and Villas we offer a variety of reception venue options from intimate tables for two, to a grand reception. Choose from our Turnbull Room or MacKinnon Restaurant for a larger affair, or for the more intimate function The MacKinnon Private Room. For weddings of 80 or more guests we have a selection of Distinction Wedding Reception Packages which include the room hire charge, bridal suite and catering. For weddings of less than 80 guests or couples who wish to design their own Distinction Wedding Package we can create a wedding reception package uniquely for you, incorporating the associated venue room hire charges. The perfect location for your Te Anau wedding reception, the Turnbull Room is an excellent reception venue for a large wedding. It has a private entrance, its own bar, air conditioning and can seat up to 140 guests in its full capacity, including a dance floor. Seats 140. Offers panoramic views of Lake Te Anau and the Fiordland National Park Ranges. 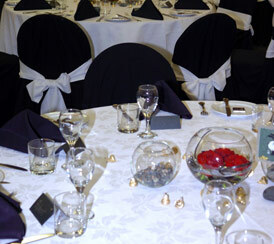 The MacKinnon Restaurant is located on the ground floor and can comfortably seat 130 guests plus a dance floor. Because it is the hotel’s main restaurant, this venue is only available between May to August in the evening by negotiation. Seats 130. The perfect indoor location for an intimate wedding reception, the MacKinnon Private Room is tastefully decorated and can seat up to 40 guests in its full capacity. Please note a dance floor and staging for a head table is not able to be placed in this room. Seats 40. Note: The MacKinnon Private Room, room hire does not include a dance floor. Note: Time allocation restrictions apply to room hire and all function rooms. Evening venue hire, maximum five hours, and must conclude by 12.30am. Lunch venue hire, maximum four hours and must conclude by 4pm. Sometimes it’s the little things that can make a big difference. If you would like to add a touch of decoration to your wedding reception venue, you can personalise the venue to your taste. From rose petals, candles and chair covers to floral table displays, your are welcome to add your own personal touches. Contact us to find out more about wedding reception decorations and detailing.